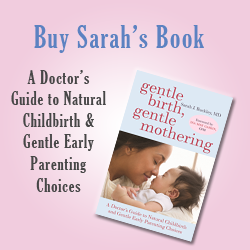 For more in-depth information on co-sleeping see Chapter 13 “Mothers, Babies and the Science of Sharing Sleep” in Gentle Birth, Gentle Mothering: A Doctor’s Guide to Natural Childbirth and Gentle Early Parenting Choices (Sarah J Buckley, Celestial Arts, 2009). As a GP [family physician], writer and mother of four, I have concerns about information that parents are being given about young children and sleep. This includes official advice to families from Queensland Health in “How Does Your Child Sleep?”(Playtimes, Oct 2001) ­ and in books such as Richard Ferber’s Solve Your Child’s Sleep Problems. Ferber’s controversial methods (“Ferberizing,”) include leaving children alone to cry for increasing periods (so-called “controlled crying” or “crying it out”.) These sources suggest that the best solution is to shut crying children in their bedrooms for prolonged periods so that they “learn to go to sleep alone”. Advising parents to ignore the cries of a distressed child, for however long, may be counterproductive to developing the loving and trusting parent-child relationship that will endure over time. I wonder how many of us would want our partners or friends to treat us this way if we were alone at night, and feeling upset and frightened? But it is not only the potential impact of these methods on parent-child relationships that concerns me. Scientific and anthropological research recognises that our babies need constant care and attention because of their extreme immaturity. Unlike other mammals, they cannot keep themselves warm, move about or feed themselves until relatively late in life, which makes dedicated maternal care crucial to our offspring’s survival (McKenna 1996). Therefore, our children have developed behaviours and expectations, to ensure that they get the care and protection that they need in infancy and beyond. For example, for a baby the safest place is in the mother’s arms—and this is still true today in many parts of the world. This applies equally at night, when sleeping right next to the mother, also called bed-sharing, gives the baby protection, temperature regulation, emotional reassurance and breast milk. It’s a perfect system, and what babies have become hard-wired to expect, over millions of years of human evolution. For our ancestors in the wild, carrying infants kept them safe from hazards and predators, and attending quickly to infant cries kept everyone safe from the attention of predators. Similarly, sleeping with babies was critical to ensure that the baby would survive to the morning. This system of care–sometimes called “proximity seeking”–generates significant parental rewards and efficiencies. Bed-sharing gives us less disturbed sleep because mother and baby both get into the same cycles, and our babies will wake to feed when we are both in light sleep. We can do more breastfeeding for less effort and therefore maximise the contraceptive effect. We will also benefit from the extra doses of two breastfeeding hormones. Oxytocin, the hormone of love, is stimulated by both breastfeeding and skin-to-skin contact, and keeps mother and baby soft and loving with each other. Endorphins are the hormones of pleasure, making mother and baby relaxed and sleepy—just right for night feeding. No wonder bed-sharing mothers and babies wake up with a smile. Worldwide research confirms the safety of bed-sharing, as long as parents are not smokers, very overweight, or under the influence of drugs or alcohol, and attention is given to avoiding the hazards that go with our soft Western bedding. Bed-sharing, where adults and children share the same surface, is one form of co-sleeping, which is a wider term that includes children sleeping in the same room in variety of configurations. Infant sleep researcher James McKenna defines co-sleeping, which includes sleeping in the same room. as mother and infant being within range of two senses, eg hearing and sight. The combination of breastfeeding with bed-sharing, also known as”breastsleeping,” (McKenna 2015) has a specific repertoire of behaviours that may be particularly adaptive–and safe–for mothers and babies. Breastsleeping babies are usually protected from common bedding hazards by the mother’s position, and babies are more likely to sleep facing the mother than on their stomachs, which may also be protective against Sudden Unexplained Death in Infancy (SUDI). Experts in SUDI and bed-sharing note, “For mothers who breastfeed, do not smoke or drink alcohol, and do not use recreational drugs the evidence of an increased risk from bedsharing is very limited.” (Fleming 2015) Breastleeping mothers and babies are more likely to breastfeed for longer (likely because of the ease of nighttime feeding), which offers further protection against SUDI. Standard advice around infant sleep is based on a cultural belief that children will not become independent unless we force them. Research suggests that the opposite may be true. According to one expert, “Research… confirms that indulgence of early dependency needs leads to independence” and “A mother’s reliability and receptivity promote trust and emotional stability in her child” (Klein 1995). In other words, when we treat our children with love and respect for their needs, we can plant the seeds for a lifetime of happiness—and relaxed sleep. For me, the benefits of bed-sharing do not end with babyhood. My older children have been equally sweet and cuddly at night, and sharing sleep into the pre-school years has its own rewards. For example, sleep becomes a time to share intimacy and loving feelings, especially when the day has been gruelling or conflict has arisen. For me, there is nothing as sweet as lying next to my child as he or she drops into dreams (and often we do this at the same time). Our family has avoided the bedtime battles or night terrors that are considered normal in our culture—and remember that our culture is out of step, in global and historical terms, in not sharing sleep between family members. Every co-sleeping family that I have met has their own unique arrangement that can change and adapt over time. At the time of writing, our middle two children were sleeping together in a double bed, and our eldest Emma, 10, had graduated, in her own time, to her own bed. We continued to lie down to settle Zoe, 8, although she says she can put herself to sleep now. Jacob, 5, often joined us in the wee hours. We have had a king-sized bed that we turned around to make it 6’6” wide and 6’ long—a real family bed for many years. These three older children are very confident and sociable, and have no problems with different routines when they sleep over with their friends. Why would they, when sleep has always been easy and pleasurable for them? My youngest, Maia, who is 15 months as I write this, continues to fall asleep most nights with Mother Nature’s best toddy—breast milk. Since my first baby, I have gained more confidence and experience with co-sleeping, and honestly, some of the things that are said to discourage co-sleeping strike me as crazy. For example, I have read in many places, including in the earlier mentioned article, that if we cuddle or nurse our baby to sleep, they may awaken later and “…may not be able to go back to sleep because their environment has changed.” As an adult waking up, I don’t remember how I got to sleep. It seems to me that our babies simply want to be held and nursed to sleep because it is pleasurable, biologically adaptive, and it works. A family bed might not suit everyone, but we can consider that co-sleeping is what we as humans have evolved to do with our young, and it is what our babies and small children expect. When we ask our children to sleep alone all night, we are stretching their biological capabilities and there is a good chance they will protest.If this happens, we can choose to take their feedback seriously and work to find loving, gentle and co-operative solutions. There are many different possibilities, and families can choose what works for them and their children. For example, some families have invited an older child back into their bedroom and found that a “dose” of co-sleeping, or even sleeping on the floor (in what Emma calls a “nest”) is all that is needed, especially during stressful transitions. In many families, as in ours, one parent lies down with a child or children until they fall asleep, giving reassurance at the time when it is most needed. Sitting quietly or meditating also work well at this time, and I am less likely to fall asleep myself. When a child is sick or needs extra care, having him or her in our bed, only an arm’s length away, feels good. Needing an extra dose of Mama or Daddy is a good enough reason most of the time, and I notice that sleeping together promotes harmony in a subtle and beautiful way. As parents, we are in it for the long haul. “Ferberizing,” “controlled crying,” and “crying it out” are short-term solutions that may not promote the connectedness and trust that we want for our children and families in the longer-term. Our children will outgrow their dependency needs—including the need for company at sleep time—in their own time. Providing love, reassurance and guidance when it is most needed will help to maximise growth and happiness in the short and long terms. Klein, Paul. (Spring 1995). “The needs of children.” Mothering magazine (U.S.) (74): 39-45. McKenna, James. (1996). “Babies need their mothers beside them.” World Health, the Journal of the World Health Organization (March-April). Konner, Melanie. (1991). Childhood. Boston: Little Brown & Co.